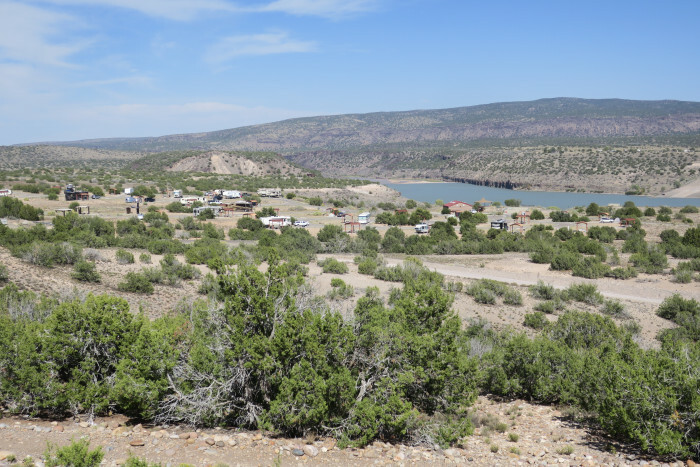 Ask fellow campers about "Cochiti Lake COE " and nearby attractions. This Corps of Engineers park is located on Cochiti Tribal lands (so, no drinking in public). Our site was level but as far away from the lake as you could get. We had electric but no water/sewer. Note, the sites with water faucets seem to be oddly dispersed but, if you have 30-50' of hose, you can reach a faucet. 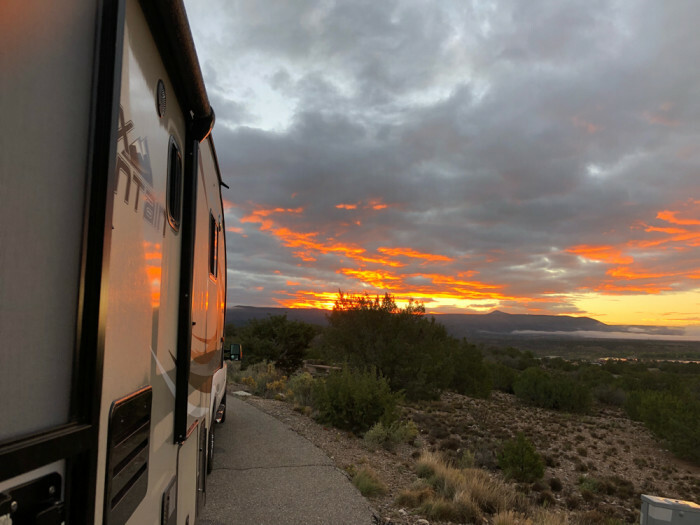 We camped at Cochiti Lake COE in a Motorhome. Tent Rocks National Monument is about 15 minutes away....its the most awesome rock structures you've never heard of. Be sure to take the hike at the first parking lot and then drive to the end of the road to the overlook. Beautiful! This is a nice clean park with some sites having views of the lake. The water and electric are placed in the proper area and worked well. There is a dump station located in the park. Most sites are fairly level but not all. We camped here in a 40' motorhome. We camped at Cochiti Lake COE in a Motorhome. We love this park. We would probably not love it in the summer though—no shade except the covered picnic tables. Free nice warm showers. Spacious sites. Some have no hookups, some have electric only and some have electric and water. Really nice park ranger. Some sites level, some a little less so. The sites higher up have such beautiful views plus we had colorful sunrises and sunsets. This park is in between Santa Fe and Albuquerque. All sites have cement picnic tables, some covered picnic tables. Swim beach. 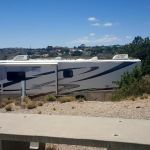 We camped at Cochiti Lake COE in a Fifth Wheel. Do NOT miss hiking Kasha-Katuwe Tent Rocks National Monument slot canyon. (Take lots of water.) We stayed 5 days but had to book 2 different sites. So hard to answer questions about the site. Wonderful space to each site as is typical of COE properties. Good trails throughout to enjoy. Nicely situated swimming area on the lake. The Visitors Center is very well done- I spent a couple hours there going through the exhibits. 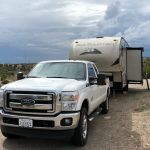 We camped at Cochiti Lake COE in a Fifth Wheel. Nearby Tent Rocks National Monument is a must-do. Cochiti COE campground is about 13 miles from I-25. Turn right onto Cochiti Lake Road after you see the large sign stating Cochiti Lake. Continue pass the stop sign until you see a large gravel lot on the right sign. Turn left into the campground. The signage is not very good once you turn onto Cochiti Lake Road. Cochiti campground consists of four loops. Juniper Loop campsites have electric hookups and some have water. Elk Run and Ringtail Loops are non-electric and have community water spigots. All sites in Buffalo Grove Loop have water and electric hookups and can accommodate a large rig. There are two dump stations - one located just before Juniper Loop and the other is near the campground office. Fresh water was available at both locations. The campground has (3) bathrooms with (2) showers per gender. The showers are activated via a push button. You cannot control the temperature. Water will turn off in about 4 minutes. The bathrooms were fairly clean. All sites have a picnic table with an overhang, a BBQ stand and a designated spot for your vehicle. There are no fire rings. WiFi is not available. Most of the sites are long, narrow and not very level. The electrical pedestals are located on the driver side near the back of the site (30/50 amp electrical service). The voltage was very good considering that it was over 100 degrees and everyone was using their A/C. There is a boat ramp and a swimming area. It was very quiet at night. We would come back to this campground. We travel with a 32 foot 5th wheel. 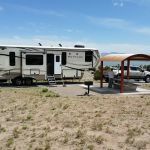 We camped at Cochiti Lake COE in a Fifth Wheel. Beautiful and well maintained COE park. 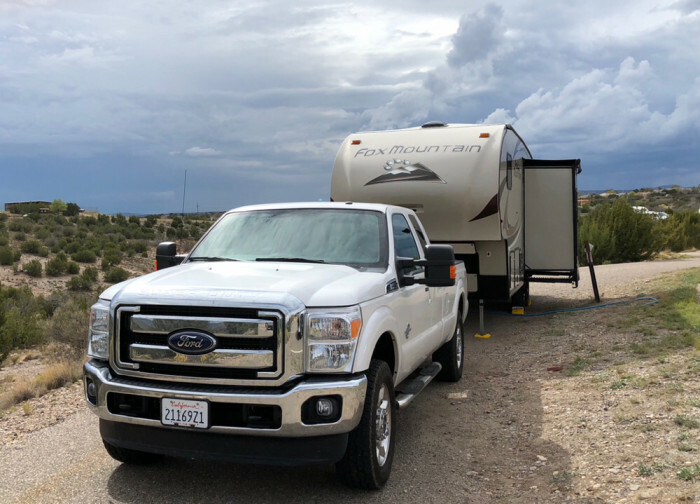 Only regret was that it was 25 miles from downtown Santa Fe and other points of interest, but very close to Tent Rock National Park which is amazing. We had a beautiful view of the lake. Very quiet area. We camped at Cochiti Lake COE in a Motorhome. What a deal! $20 for electric and water. We have a 35 foot 5th wheel and had more than enough room. Each site has a pretty covered patio and grill, but right now no fires, including charcoal. Sites are spaced well apart. Very quiet. There is a boat ramp. We went 20 minutes away to hike the slot canyon at Tent Rocks National Monument. About 40 minutes away is Santa Fe. Will come back of in the area again. 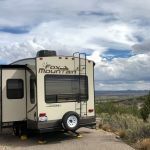 We camped at Cochiti Lake COE in a Fifth Wheel. There is a mini Mart nearby, but closest grocery is about half hour. Wonderful! We stayed here a few years ago and loved it. Since we were headed West again we put this CG in the schedule first. Great views, clean/functional facilities, good OAT and a price that can't be beat. Of course... you have to reserve well in advance. The COE is one of the few government programs I like having my taxes support. We camped at Cochiti Lake COE in a Motorhome. Went for a drive with the dogs one day and saw the signs for Tent Rocks National Monument. Figured we would drop in to see what it was. After the 10 mile detour and the 1/2 hour in line we were greeted with a sign at the fee station that said, "No dogs. Violators will be fined $250 per dog." We turned around. Might be nice, but had there been a sign about the restriction earlier we wouldn't have taken the detour. The BLM is NOT the Army COE. Pro: senior passes accepted. Convenient stop on our annual sojourn North. Juniper loop has water & electric on inside loop, outside loop is only E. Some sites will require 75' water hose. Even Google 3D doesn't do justice to the hilly terrain. We are literally backed into the hillside - check site length before reserving (great for wind protection and privacy). Tables & Grills are up/down steps at most sites in Juniper Loop, this loop is farthest from lake. Cons: Restrooms in our loop were closed. Asphalt pads are narrow making exits from the rig somewhat treacherous depending on site. Stone Kiva Restaurant at the nearby golf course is has good food, simple choices, otherwise bring your eats with you or trek 20 miles to Santa Fe or Albuquerque. Note to self: Golf course looks fun and is reasonably priced (~$50 inc cart/18 holes). 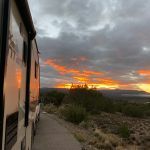 We camped at Cochiti Lake COE in a Motorhome. Try the Stone Kiva Restaurant & golf course. This is the second time that we have stayed at Cochiti Lakes and love this park but we did notice a decline in the maintenance of the facilities. The restrooms were not maintained regularly and at times unavailable. On the positive side, the park is quiet and biking areas are plentiful. There are elevated grills at each site and covered picnic tables on concrete pads. Washing of your RV and tow vehicle is allowed and much appreciated. Some of the sites can be challenging to level but overall a really great place and the rates are unbelievable. If they maintained the restroom facilities, this would be a "10". We will be back. 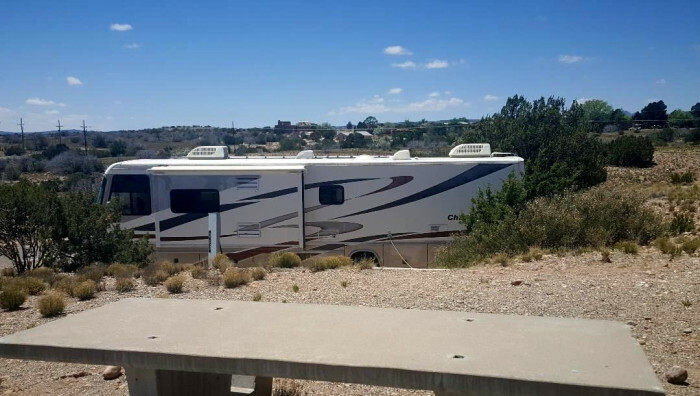 We camped at Cochiti Lake COE in a Fifth Wheel. Hike the slot canyon at Tent Rocks National Monument, great hike! Take your dog to the "Dog Beach" for a dip, great addition. Bike ride on top of the dam, hard surface road, and no public vehicles! Sites are large but the asphalt parking space is very narrow. It was difficult to go in and out of our door. Excellent Verizon cell service. Very good electric. Difficult to find water spigot to fill our tank. Many sites are very uneven and asphalt is broken up in some. Some loops have water and electric on only one side of the road. Ours had electric in most sites. Other side of the road had electric, supposedly shared water hookup. Most campers hooked up to the water, making it difficult for others to get water. 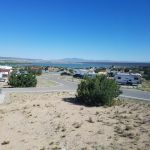 We camped at Cochiti Lake COE in a Travel Trailer. This is a nice park in the hills south of Santa Fe. It is on a reservoir but don't anticipate being on the water, near the water or even being able to have much of a view. The sites are spacious, with a shelter and table. There are absolutely NO FIRES allowed. Over the air TV is pretty good, about 8 clear channels. There is no WIFI at all. Cell service with AT&T was good. SItes were paved, several pull-thrus and large back-ins. This is an Army Corp of Engineers site so it is well done. The only complaint we had was there was no one working there. Weird. Of the 10 days we were there, the campground office was only staffed one day. Tried to change some things regarding our reservations and couldn't. Tried the Visitor Center and the one volunteer pretty much had no clue. This park is about 20 minutes from Santa Fe and an easy drive. The reservoir can handle some good size boats but it is a trek to the launch site or shore. It really was a nice place to stop and stop looking through a windshield for a while. Santa Fe was a great town. Really enjoyed Canyon Road. We camped at Cochiti Lake COE in a Motorhome. This is the most beautiful COE park we have been to. Stunning mountain and lake views all around! The park is about 12 miles or so from the highway so it's secluded and quiet. We stayed in site 56 - a fairly level pull through site in the Buffalo Grove loop with water/electric only. Site was nicely cleaned before our arrival and, in fact, the entire campground was probably the cleanest we have ever seen in our travels. The park does not have any FHU sites. Interior roads are paved but somewhat narrow. The sites are also paved but some will need leveling blocks as they slope front to back and/or side to side (especially the pull through sites). The campground has a strange layout and the loops aren't well marked. The gatehouse/check-in area has the strangest hours I have ever seen. Sunday-Thursday they are open 9-11 a.m. and then 3-6 p.m. Friday and Saturday they are open 9-11 a.m. then 1-4 p.m. and again from 6-8 p.m. Sites have a covered picnic table, grill and lamppost light. Dump station was easy to get in and out of. We were able to get 60+ OTA channels and Verizon service was very good. Bathroom/shower area was newer and clean. There were two toilets and two showers separated by a sink area but shared by two loops so there might be a wait to use them. No laundry facilities here. The park has a boat ramp and swim beach along with a small yet informative visitor center. Overall, we really liked this park and would definitely return. 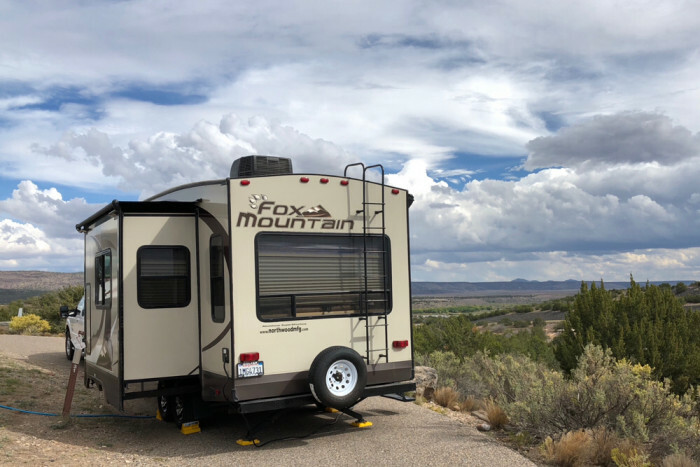 We camped at Cochiti Lake COE in a Fifth Wheel. The nearest Walmart and grocery store is in Santa Fe about 20 minutes away. There is a convenience store and laundromat just outside of the campground. Kasha-Katuwe Tent Rocks National Monument is a short drive (15 min) and we really enjoyed the experience! We also spent an afternoon at the Camel Rock Casino in Santa Fe. Location, location, location. I'm talking site 53 with beautiful view of lake and surroundings. Electric, water no sewer or would have given it a 10. Good Verizon 3G. 40 minutes to Santa Fe but so nice here we're not going. Have been before. Would definitely come back. Grill but no fire ring. Covered picnic table. 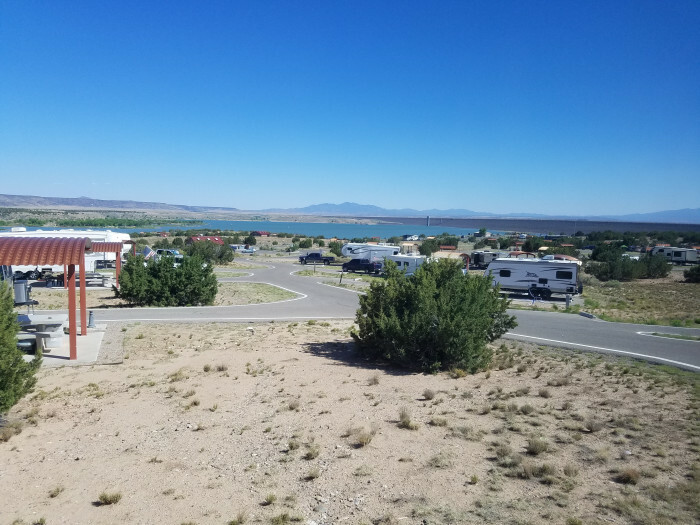 We camped at Cochiti Lake COE in a Travel Trailer. Four day visit and what a great site. If there had been sewer it would be a ten. Great bike riding and hiking in park. Water and 50 amp electric good. Our site - 34 on the Juni Loop only required 25 ft water hose and 30 foot electric. Need park map to get around till you get the hang of layout. CHEAP gas just outside of park with small well stocked store. Juni restroom was closed but others nearby were newer anyhow. Site 34 was easy in first try with our 38ft motorhome - actually could take 40 footer with some room to spare. No wifi but Verizon hotspot handled web surfing and email. Actually had two picnic tables with one covered. Juni Loop is showing it's age but is still a very good choice. Just about every site in the loop has fantastic views. Plenty of toad parking space along edge of road and next to RV with careful RV spotting. We camped at Cochiti Lake COE in a Motorhome. Must see Tent Rocks Nat Mon - maybe 15 minutes away. There are many things to see in the area including touring Santa Fe. There is the Scandia Peak Tram ride in Albuquerque (we suggest the sunset tour), Valles Caldera National Preserve, Bandelier National Monument, Jemez Springs, The Turquoise Trail, The Scandia Crest Drive (can be rough but beautiful) and many other beautiful back road drives. We also sampled many of the casinos in the area. There are many pueblos in this area. You may visit them but take no pictures in them. if your bringing your dog make sure you have poop bags. There are several sites around the campground but the bags are all gone. I did ask about them there response was people keep stealing them . Kasha Katui (Tent Rocks) is very beautiful park for hiking and viewing tent rocks-10mins from campground. Old Santa Fe about 40 minutes, Bandelier National Monument about 1hr - very beautiful and well worth the trip (a lot of hiking and climbing ladders), Albuquerque (Old Town) about 1hr. Nice little restaurant at the local golf club, otherwise bring everything with you. Tent Rocks are amazing to climb - a couple different trails for young and old. There is not a lot out in this area so be sure you have your supplies with you. Mini mart and laundromat nearby in Cochiti lake town. Nearby pueblo had a celebration going on and we got to see at least 200 hundred Native Americans celebrating in full dress. There's a Visitors Center with info nearby. Tent Rocks is a must see (NOT dog friendly), hike the slot canyon trail to the top. Drive and explore the Turquoise Trail, especially the drive to Sandia Crest! Be sure and check out Kasha-Katuwe Tent Rocks National Monument (only 15-20 minutes away) and take the slot canyon trail. The slot canyon is a treat as are the endless views once you get to the top. The Kasha-Katuwe Tent Rocks National Monument just a few miles down the road is worth a drive and a nice hike. There is an easy paved 1-mile loop trail, and also a more challenging additional mile hike to see the formations from the top. There's also the Veteran's Highway and takes you to another nice scenic point at the top. It's worth a visit. Tent Rocks is amazing and very close. Laundromat, gas and diesel, convenience store, golf and fishing within a mile. Santa Fe is half hour. Visit Tent Rocks National Monument. 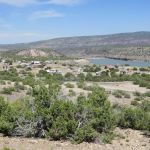 Are you affiliated with Cochiti Lake COE ?